French, Head of a Noblewoman, 14th century. Marble; H: 11 3/4 in. Milwaukee Art Museum, Gift of The William Randolph Hearst Foundation through the Milwaukee Sentinel M1958.67. Photo by John Nienhuis. Just as you walk into the Museum’s Gallery #3 (Northern Renaissance artworks), on your right is a display case that holds a marble sculpture. It’s an unobtrusive work labeled Head of a Noblewoman, French, 14th century. I’m sure many Museum visitors have walked right by it and not even thought twice. The most interesting thing for those that look closer may be the way the artwork is positioned in the case–it is shown lying down, not upright. This sculpture is more than just a portrait of a French noblewoman. It’s a portrait of the noble French woman from her tomb! Originally, the Museum’s head sculpture would have been part of a full body sculpture of the woman lying down, and it would have rested above her tomb. You can be certain of this orientation because the back of her head is unfinished. Although funerary portraits were used as far back as the ancient Egyptians, medieval Europe saw an explosion of them. Examples are known from the 11th century, and by the 13th century they were filling churches and abbeys. Of course, only those who could afford to have an elaborate tomb could have such an elaborate sculpture, so most examples are of kings, queens, and other nobility, including knights, such as Jean d’Alluye, whose tomb effigy is now at the Metropolitan Museum of Art. Here is a photograph of tomb effigies in their original location at the Abbey Church of Saint Denis, in France. In the foreground are Jeanne of Bourbon (1338-1378), Queen of France and just behind her is her husband, King Charles V of France (1338-1380). Many tomb effigies have their hands clasped in prayer, such as the tomb of King Henry VII (1457-1509) and his wife, Elizabeth of York (1466-1503) at Westminster Abbey in England. Other figures hold things—for instance, Eleanor of Acquitaine (ca. 1122-1204) at Fontevraud Abbey in France holds a prayer book, which illustrates her piety. But what was the original context or use of gisant? Many interpret that gisant were a way for the deceased person to proclaim his or her faithfulness—and social status—while waiting for the resurrection to come. Head Shown Upright. 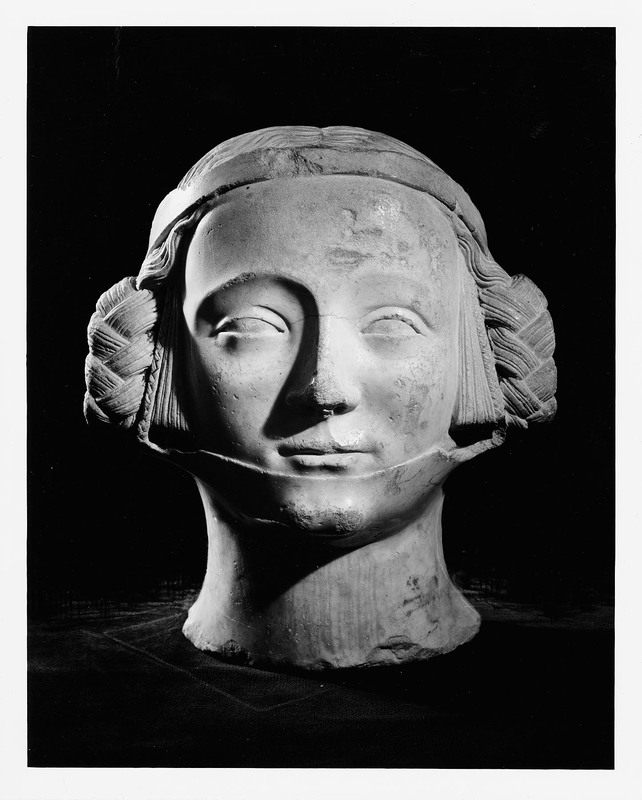 French, Head of a Noblewoman, 14th century. Marble; H: 11 3/4 in. Milwaukee Art Museum, Gift of The William Randolph Hearst Foundation through the Milwaukee Sentinel M1958.67. Photo by P. Richard Eells. As time went on, tomb effigies developed into new types. In the 15th century, cadaver tombs, or transi, became popular. These tombs depicted the usual gisant on a platform above another figure that was clearly dead –or just a skeleton. An example is this effigy of John FitzAlan, the 14th Earl of Arundel (1408-1435) that can be found at Arundel Castle in Sussex, England. This is clearly a reminder that although the pious dead will rise again, no one can escape a mortal death. A Renaissance development was a tomb effigy that showed the deceased in a more life-like state, meditating on the next life. In their tomb from 1566 in Bisham, Windsor, Sir Philip Hoby (1505-1558) and his half-brother Sir Thomas Hoby (1530-1566) have their heads up on one arm, almost as if they are ready to converse with visitors. Then, in the Baroque period, the tombs become even more dramatic. Take the tomb of French Cardinal Richeieu (1585-1642) at the Church of the Sorbonne in Paris. The Cardinal sits up, his hand to his breast as if about to orate, while two mourners, one with her head down at his feet, fawn over him. These types of sculptures were perfect for the Neoclassical period of the 18th century, when cool, white marble was the preferred medium. Here is the 1775 monument to Joseph and Caroline Damer in Milton Abbey, designed by Robert Adam and carved by Agostino Carlini. Joseph looks down sorrowfully at his wife who lies next to him, looking asleep although she has passed away. And the tomb effigy phenomenon is not reserved for Europe! For instance, the Lee Chapel at Washington and Lee University in Lexington, Virginia, has a sculpture of Robert E. Lee “asleep on the battlefield.” Although Lee is actually interred in the crypt below the sculpture, this sculpture by Edward Valentine (American, 1838-1930) is obviously inspired by the gisant of Europe. 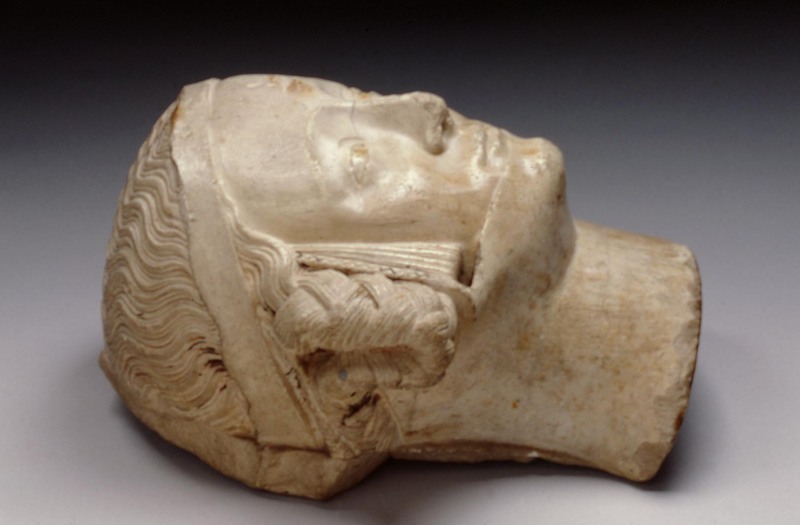 But let’s return to the 14th century and Milwaukee’s Head of a Noblewoman. Because we do not have the name of the lady, we must date it based upon the appearance. In that, her headdress gives us many clues. What women wore on their heads in the middle ages can be fascinating study. In the 12th and 13th centuries, the most common adornment was a barbette and fillet. The lady on the left in this page from the Codex Manesse (1330-1340) is wearing both pieces. A barbette is a chin strap that wraps around to the top of the head. It literally translates as “little beard.” The fillet is the strap of fabric that encircles the head, almost looking like a hat from the side. Many times, the fillet would hold a veil in place to cover the hair—which was important for the modest medieval lady (you can see the veil and barbette on Eleanor of Acquitaine—her crown covers up the fillet). Another headdress was the wimple—familiar to us as the traditional headdress of Catholic nuns. A wimple completely covers the hair and neck with fabric, as shown in this Illumination from Maciewjowski Bible, ca. 1250. As the middle ages progressed, this style was used less for daily wear unless you were a nun or widow. French, Head of a Noblewoman, 14th century. Detail. Marble; H: 11 3/4 in. Milwaukee Art Museum, Gift of The William Randolph Hearst Foundation through the Milwaukee Sentinel M1958.67. In the 14th century, the fillet and barbette gave way to a metal circlet, sometimes holding a veil on the head. Ladies also wore a piece of fabric pulled over the chin called a gorget. The gorget was usually held in place by braids that looped up in front of the ears (which were usually fakes attached to the circlet!). As you can see in the above detail of Head of a Noblewoman, this is how we can date Milwaukee’s sculpture to the 14th century. Compare her ornament with the two ladies from the Luttrell Psalter, ca. 1325-1333 or the Tomb Effigy Bust of Marie de France (1327-41), daughter of Charles IV of France and Jeanne d’Evreux, ca. 1381 at the Metropolitan Museum of Art. Milwaukee’s sculpture was eventually purchased by the American newspaper magnate William Randolph Hearst (1863-1951). Inspired by trips to Europe as a child, he dreamed of creating his own European manor house. The result was what is now known as Hearst Castle in San Simeon, California. He purchased so much artwork for the house, that upon his death some reports said that 25% of the world’s art market during the 1920s and 30s was due to his collecting. Although this is probably exaggerated, it shows how important his collection was at the time. Hearst was a great patron of the Los Angeles County Museum of Art, gifting it many pieces of artwork during his lifetime. After his death, much of the remaining collection remained on view in the Castle, but the Hearst Foundation (which he had founded in 1945 for charitable giving) also gifted artwork to museums across the country. In 1953, the Milwaukee Art Center received the Belgium tapestry Refusing the Gifts of the Samnites (on view in Gallery #2) from the Hearst Foundation. Then in 1958, the Milwaukee Sentinel (which was a Hearst-owned newspaper) facilitated the gift of Head of a Noblewoman, which had been purchased by Hearst in France. So, the next time you walk through Gallery #3, make sure you take a longer look at Head of a Noblewoman. She’ll not only give you a glimpse into the middle ages, she’ll remind you of the interesting things that she has “seen” since then. This entry was posted in Art, Curatorial and tagged effigy, European art, French Art, From the Collection, gisant, Hearst, Marble, Medieval art, sculpture, tomb, Women in art. Bookmark the permalink. When I was a child I always watched tv then I sometimes watched a channel that features a museum. Thanks for sharing this. Museum is a collection of pieces of art, artefacts, and things that happened to history. Ms. Sawinksi (or anyone else who has an idea): I would love to hear your opinion on what the vertical triangular features touching the sculpture’s cheeks are. I’ve seen them on other sculptures, but not on manuscript paintings of similar subjects. The obvious answer would be hair, but how does that fit in with the braids? Hmm . . . I’m hoping that your more intimate acquaintance with the piece gives you insight that photos cannot. Thanks! Pamela–great question! I have not found a source that explains that part of her hairdo, although Marie de France at the Metropolitan Museum of Art has a similar configuration. Those triangular parts look like they are attached to the circlet just like the braids. It could be additional “fake” hair held in a loop around her ear, or it might be a piece of fabric with small accordion folds. Because the fabric gorget appears to come down the side of her head between the small braid and the triangular part, I’m inclined to think that those triangles are also made out of fabric–reminiscent of a wimple but much fancier. Even when looking at the sculpture in person, it’s hard to tell. Thanks for your thoughtful response, Catherine. Somehow your answer got lost in my inbox, and I only now discovered it. It really is mystifying. I’m still looking for a solution, and if I come up with anything, I’ll let you know.